The state fleet from the DPW plows the Post Road, looking eastbound at the corner of Imperial Avenue, during the snowy day on Tuesday, Feb. 12, 2019, in Westport, Conn.
WESTPORT — Skies were snowy and roads slick as wintry weather made its way into town Tuesday morning, causing school and business closures. 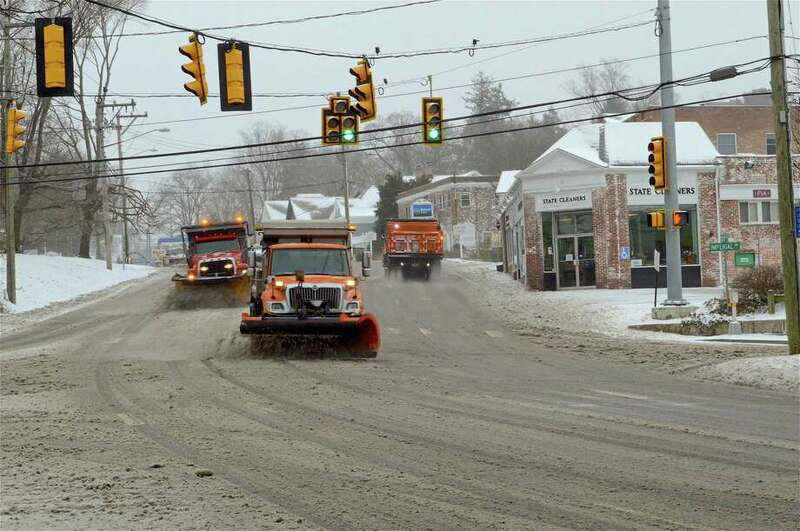 Snow changed to sleet and frozen rain in the early afternoon, Westport Public Works Department Director Pete Ratkiewich said around 1:30 p.m., noting all residents should stay off the road. Westport received little snow accumulation in the morning, with only 1 or 2 inches reported, depending on where in town is measured, he said. The sleet and freezing rain will continue into the evening. Because there’s a warm snow layer on top of the cold ground, the rain freezes when it reaches the surface, creating dangerous driving conditions. “People should stay off the road as much as possible so we can clean up. We’ll be starting to plow sometime in the next few hours. It’s better to let the ice fall on top of the snow so it doesn’t become a big ice slick, but eventually we’ll plow,” Ratkiewich said. The temperature will rise in the evening, which should make the roads fine by the morning, he added. Westport Public Schools heeded the weather warnings, with Superintendent Colleen Palmer tweeting Monday night that schools would be closed Tuesday due to the storm’s timing. The Westport Country Playhouse box office, Westport Center for Senior Activities and Suzuki Music Schools of Westport also announced closures via social media due to the weather. Meanwhile, the Granola Bar on Post Road East stayed open until 1 p.m.
Several traffic disruptions occurred in neighboring towns, including multiple motor vehicle accidents on Interstate 95, northbound and southbound, near Exit 22 in Fairfield around 11:25 a.m. Another collision was reported near exists 23 and 24 around 2:20 p.m. The hazardous conditions will also impact the evening commute in Westport, according to the National Weather Service.